Thinking about bringing home a Savannah cat? Or just curious to learn more about this fascinating new pedigree breed? Savannah cats are one of the cat world’s newest pedigrees. They have gained a steady following in the last thirty years. And interest in them is growing. Here are our readers’ top questions about the breed. 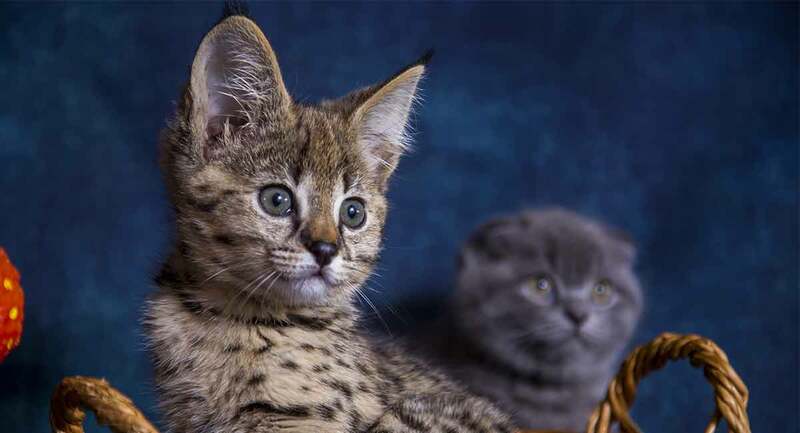 What does a Savannah cat cost? 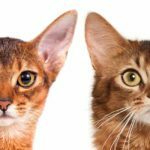 Are Savannah cats legal to own as pets? What is the lifespan of a Savannah cat? Click on the links to find the answers, or scroll down to read the full indepth review. Although you can estimate some traits of the Savannah cat, it is a hybrid. This means that many of the earlier generations will be unpredictable. The history of the Savannah cat is interesting. Oddly enough, we know the exact day the first Savannah kitten was born. It was Monday April 7th, 1986. Savannah cats are hybrids of domestic cats and servals. That spring the first Savannah cat kitten was born to a female domestic cat who had mated with a male serval. Servals are medium-sized wild cats found across sub-Saharan Africa. They are cousins of the better-known lynx and ocelot, and they sport the same spotted coat. But the first thing you’d notice about a serval, were you ever to bump into one, is their outrageously long legs. These are a result of elongated bones in their feet. The new kitten charmed it’s owner, and the Savannah cat breeding program began. Fifteen years later in 2001, Savannah cats were officially recognized. But only by The International Cat Association (TICA). So far TICA is the only body to recognize them. Savannah cats are almost always described with a filial number. For example F1, F2, F3, F4 etc. An F1 Savannah cat has a serval parent. An F2 Savannah cat has a serval grandparent. An F3 Savannah cat has a serval great grandparent, and so on. So, the filial number is a rough guide to how far removed from servals an individual cat is. Telling you how much wild cat DNA they possess. The rule for calculating how much serval DNA a Savannah cat has looks as simple as dividing by two. But in reality it is usually made more complicated by the practice of back crossing. That is, mating across different filial generations. Back crossing early generations of Savannahs is popular. It’s carried out to “fix” as many serval characteristics as possible. Doing this at the beginning of the breeding line is popular for keeping that wild look. For example those lanky long legs. F4 Savannah kittens are the first generation to be considered purebred Savannah cats. No longer wild cat hybrids. When you meet a Savannah cat breeder, they should be able to provide a detailed family tree for their kittens. As well as a calculation of how much serval DNA each one has. The secret of the Savannah’s mesmerizing appearance is extremes. None of their features are quite what we expect to see in a domestic cat. Their legs are just a bit longer than we’re used to. The Savannah cat’s tail is just a bit shorter. And when they jump, boy do they jump. Savannah cats fall somewhere on a scale between domestic cats (9-11lb) and servals (20-40lb). Usually around 11 to 30lbs in weight. F1 and F2 generations are the biggest, and subsequent generations tend to get smaller. Decreasing as their serval ancestry becomes more dilute. F4 Savannah cat size is equivalent to a normal medium or large domestic cat (around the 11-13lb mark). That doesn’t mean they’re not imposing though. Large Savannah cats are taller than most domestic cats. Even in lower generations, their long legs and muscular build give the impression of height and size. Even when their weight is comparable to other domestic cats. Savannah cats have been meticulously bred to retain as much of their serval appearance as possible. Purebred Savannah cats have crisp and distinct spots on their coat. They also have dark “tear stain” lines. From the inside corner of their eyes to the corners of the mouth. And ocelli (eye shapes) on the back of their ears. Savannah cats come in four background colors. These include golden brown, silver, smoke and black. Well you can have them in any color you like, as long as it’s black! Savannah cat temperament can vary a lot, due to their hybrid origins. However, they tend to be described from F4 and beyond very favorably. Earlier generations are less predictable, as a result of having a higher proportion of wild cat in their DNA! Savannah cat temperament is thought to be very dog like. Savannah cats are one of those breeds often described as a dog inside a cat’s body. They are loyal and loving, and they are also fiercely intelligent. Savannah cats require lots of mental stimuli. To keep them from tearing up your home you’ll need a large stash of toys. As well as plenty of diverting and enriching activities to keep them occupied. Savannahs are also incredibly athletic, easily jumping two metres from a standing start. Being curious fellows, they’ll use this prowess to explore every possible corner of your house. It’s this combination of wit and playfulness which gives Savannah cats their bright and entertaining personalities. It makes them so beloved by their owners. The feelings are usually reciprocated too. Savannah cats are known for meeting their owners at the door when they get home. But are they actually legal to keep as pets? Are Savannah cats illegal in my area? Due to their unusual ancestry, some regions have strict rules about owning Savannah cats. And some places have prohibited it completely. Please note these lists have been compiled with the most up to date information I can find. Please check the rules in your area before you commit to buying a Savannah cat. And let us know if any of our information is out of date! In the United Kingdom, F2 Savannah cats and lower are legal. F1 Savannah cats require a special license. If you’re reading this in Australia, all generations of Savannah cats have been illegal since 2008. The government’s rationale for this, and the counter-arguments by critics, are a thought-provoking debate. On the rights and wrongs not only of creating wild cat hybrids. But importing alien species and managing unwanted cat populations at a national level too. Savannah cats can be unpredictable, especially in the F1 and F2 generations. Being illegal in some areas has led to some people thinking they are dangerous. But this does not mean that they are aggressive. They might be less easy to live with than your average domestic cat. And their size means that if they did scratch or bite it could have more impact. But we can’t find any research to suggest they are a danger to their families. But can they be kept indoors or do they need outdoor access? Savannah cats love to be around people. They often have no desire to stray far from their owners. Many will adjust to life indoors, provided you supply plenty of entertainment. But Savannah cats are enthusiastic athletes. Sometimes it can be hard to satisfy your impulse to run and jump indoors. When this happens they can get bored and destructive. The best way to be confident they will burn off their energy appropriately is by letting them roam outside. There’s a quirky compromise to be had too. Lots of Savannah cat owners report successfully teaching their Savannahs to walk on a leash outdoors! It’s important that they get plenty of exercise. Not just for to combat boredom, but also for their health. The biggest problem with Savannahs is creating the first F1 hybrid. The one between a domestic cats and a serval. 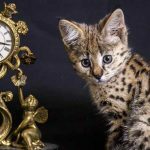 Domestic cats and servals have different gestation times. This results in a high number of aborted pregnancies, still births and deaths in early infancy. But once these hurdles are overcome, most Savannah cats enjoy pretty good health. There are two conditions worthy of mention though. They seem more vulnerable to hypertrophic cardiomyopathy (HCM) than their moggy counterparts. 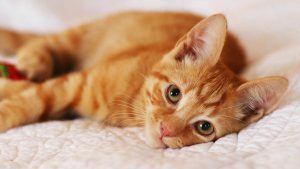 Cats with HCM have an enlarged heart, which can impair function and result in sudden cardiac arrest. In an ideal world, all pedigree cat breeders would have their breeding cats regularly checked for HCM. But unfortunately there is no requirement for them to do so. You will need to make sure your kitten’s parents have had these checks carried out. And ask for proof from the vet. Early generations of male Savannahs suffer Hybrid Male Sterility (HMS). HMS means that male Savannahs are born with incorrectly developed testes. They remain infertile in at least the F1 and F2 generations. Very, very occasionally a fertile male Savannah is born in the third generation. But the F4 generation is the first to produce reliably fertile males. In fact, Savannahs are proving a valuable species for scientists at Texas University. They are trying to understand HMS, and how it works to keep all species distinct. Instead of infinite hybrids cropping up all over the place. HMS doesn’t really affect male Savannahs very much, but it certainly does affect their price. And Savannah cat lifespan is fairly good. Estimates on Savannah cat life expectancy vary depending upon where you look. However, most reports tend to put them between 15 to 20 years. Savannah cats tend to prefer a wet diet with a large meat component. Your Savannah cat breeder should be able to discuss their parents’ diet in detail. They should also give you a small amount of the food your kitten has been weaned onto in their going home pack. Savannah cats have been bred primarily for their temperament, body shape and coloring. Their coat has remained short, slightly coarse and practical. Just like their wild ancestors. It doesn’t require much grooming. A gentle brush every now and then will suffice. And should help to catch stuck pieces of debris (especially if they’re an outdoor cat). This breed can make great pets for the right homes. Savannah cats crave one-to-one attention. For this reason they are perhaps incompatible with raising small children at the same time. But they are highly sociable and rarely shy of people. This makes them a great pet for older children. Savannah cats are still pretty rare, owing to the biological challenges of creating them, and their youth as a pedigree. However, it’s not completely unheard of to find Savannah cat for adoption every now and then. If you wish to go down the route of Savannah cat rescue, you might have to register your interest with local agencies. Then brace yourself to be a little patient. Alarm bells should ring if they try to sweep your concerns under the carpet. So, you’re confident that a Savannah cat is the breed for you? And you’ve checked they are allowed where you live? Then your kitten search can begin! The TICA website maintains a list of Savannah cat breeders, and more can be found online. When you have found one you like the look of, you will need to ask a lot of questions. Make sure that the breeder has carried out health tests on the parents. And that they are knowledgeable about the breed. Savannah cats are really, very, very expensive. F4 and F5 Savannah cat kittens usually costs between $1,000 and $2,000. F8 Savannah cats tend to be sold for around $600 – $700. 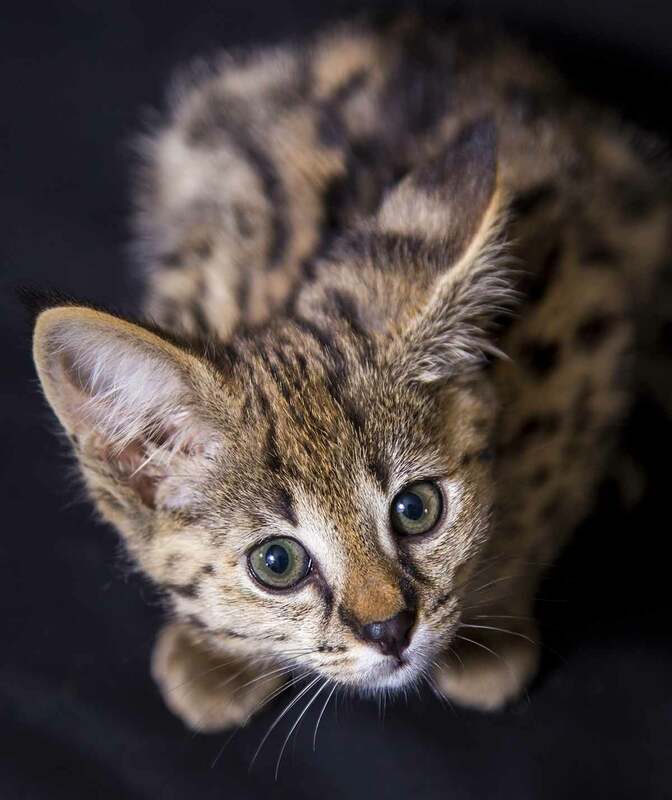 Expect to pay a premium for kittens of any generation who have inherited especially serval-like features. Already decided you specifically want a male Savannah cat or a female Savannah cat? You’ll need to bear in mind the effect of Hybrid Male Sterility on the price of a Savannah cat. In the F1-F3 generations the males are usually sterile. This means that female Savannah kittens are much more valuable than male Savannah kittens. Although in reality they are usually kept or promised to other breeders before they are even conceived. They are rarely found for sale. From the F4 generation onwards, the value of female kittens drops. This continues as they become further removed from their serval relatives. But the males become fertile, so their value goes up. So it’s easier to find an F3 Savannah male kitten on the market than an F4 Savannah male kitten. Bringing up any kitten is an important job. But with exotic breeds like the Savannah cats you really need to get it right. Fortunately, we’ve got lots of great free guides to help you. Getting a cat is a big decision. Especially when it’s a rare breed. So let’s run through those pros and cons one last time before you take the plunge. They are big and active. Need lots of attention, time and toys. Might become destructive if left alone too regularly. And there are some serious health problems that they can be prone to. They are fun and interactive. Will play with you to your heart’s content. Love to be together and spend time with you. And you can help to reduce the chances of heart problems through choosing a kitten from health tested parents. 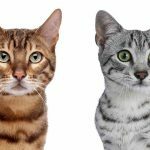 Still stuck on whether to get a Savannah cat or another breed? Check out our comparison guides here! We’ve even looked at the question of Savannah cat vs Dog, due to their canine compatible character! So what if you’ve come this far and decided that a Savannah cat is not right for you. Or realized that they are outlawed in your area? 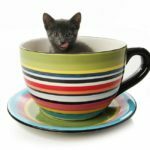 Well there are some great alternative breeds, with exotic looks and devoted personalities, but which are completely domestic. Oriental shorthair cats are lean and muscular like the Savannah cat. They also have the same big eyes, big ears, and big personalities. Oriental shorthairs come in almost every possible coloring. Including spotted tabbies, which look a little like the Savannah. Ocicats are three parts siamese and one part abyssinian. Discovered by happy accident in the 1960s. 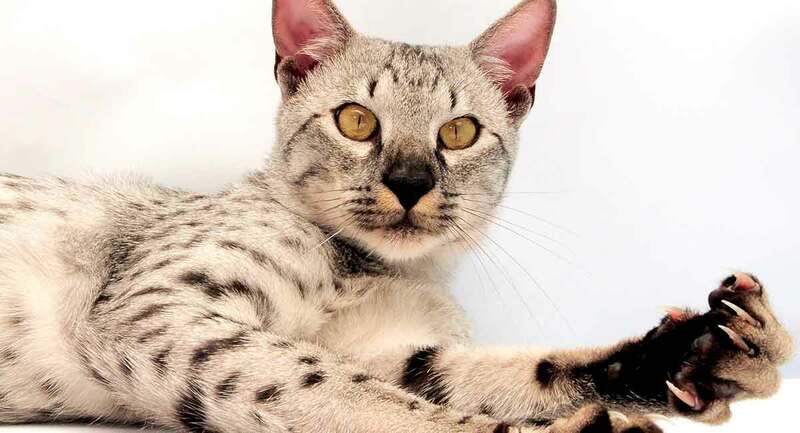 The breed became popular because their spotted coat gives them the appearance of a wild cat. Without any wild cat DNA. Their temperament is friendly and energetic, so they make great family pets. David, B. W. 2015. Mechanisms Underlying Mammalian Hybrid Sterility in Two Feline Interspecies Models. Molecular Biology and Evolution. Gelberg, H. B. 2009. “Purkinje fiber dysplasia (histiocytoid cardiomyopathy) with ventricular noncompaction in a Savannah kitten”. Veterinary Pathology. Great article. I would love one of these kitties when I retire. I have a serval I plan to mate with an f2 tica registered female. 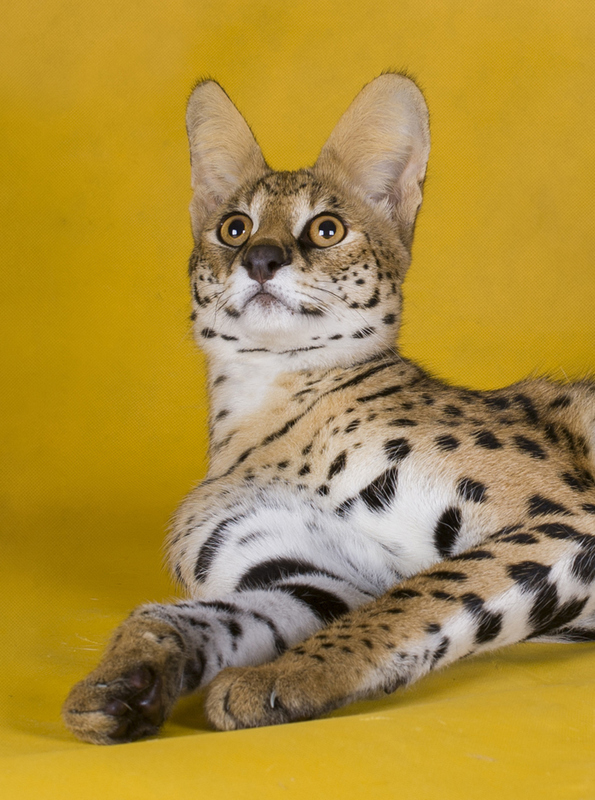 She is 34% serval. Do u have any F3 available? Savannahs shouid not be allowed to roam outside. They don’t have the homing beacon of a domestic and will easily go much farther away, getting lost. Earlier generations have a more distinct look and can find themselves shot being mistaken for an actual wild cat. I don’t advocate any cat being allowed to roam due to risk of being hit by a car and other dangers, but there’s additional risk associated with Savannahs. I own 2 F2s, would never own another breed as they are amazing, but they are a lot of cat requiring a sense of humor. This site has been really helpful, thank you. My husband decided to buy a savanna cat after our last cat we think got taken away from foxes. He is an f6 2 years old and gets me into trouble with the neighbours! He had got in the one neighbours house and was caught trying to get their fish out of their tank! I didn’t know anything about savanna cats and I’m learning as I go along. He gets so bored easy and find it hard to entertain him. I have brought him lots of toys and he plays the neighbours and he still moans. The nice thing is every night he sleeps with my 9 year son and they snuggle up together. I am in the process of purchasing to 6 week old Savannah Bengal mixed kittens. I was told that the father is an F1 and if the mother is a Bengal. However I am wondering how true this is because from what I’m reading the mail F ones are sterile. We just purchased a 3 month old Savannah F5 cat. We brought him home. What are some things I should do when I bring him home? i am VERY interested in owning a Savannah cat, but the price is so high. I have shared my home with at least one cat (usually 2) for as long as I can remember. I recently lost my best buddy Fatty to an at the time unknown kidney disorder. I am very sad, and I can’t replace him, but I would like to share my time with a male Savannah if anyone knows of one that needs rescued. i would be grateful for any information that I can get. I got my Savannah cat by accident and didn’t know I had one until I happened to see an article about them. I wanted a kitten to keep my other cat company after one of my cats died. The vet had kittens for a nominal fee, less than 100 bucks. “Buddy” just took to me right away, climbing all over me. His hind legs are longer than his front. His tail has black rings, and a black tip. 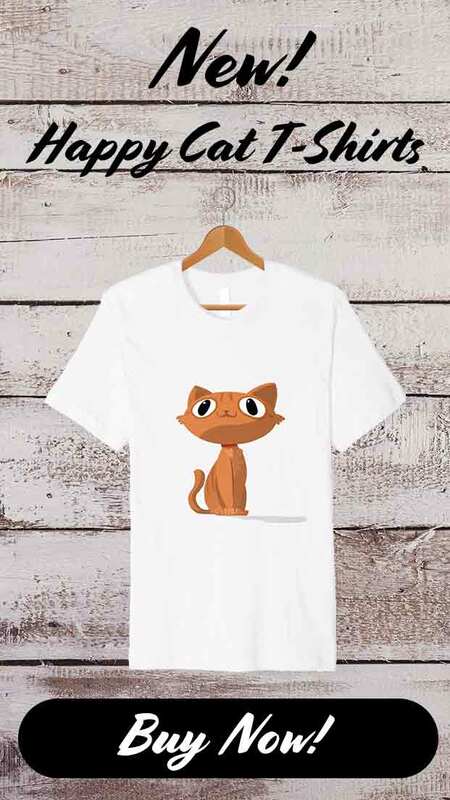 He has the stripes on his neck and stripes, spots and a tabby look elsewhere. He has white socks and feet. He is exceptionally friendly to me, very loyal, and needs to know where I am all the time. If I go to another part of the house he calls out to me in order to find me. I call back, and soon he wanders into the room looking for me. He loves chicken and other meats. Strangely, he loves the skins of those small tomatoes and will try to eat right from my mouth if I let him. He sleeps close by me. If I sleep on the couch, he sleeps on the top of the back of the couch. Something similar happened to me. There are a couple of outdoor cats that hang around the backyard and I will feed them. I have two indoor cats. One day I saw this cute little kitten, maybe two months old, keep coming to the back porch and would brave the other cats wrath when she would try to eat from their bowls. She would run away when I came outside but would always come back within a few minutes. She became used to me really quickly and soon became my newest indoor kitty. She follows me everywhere, meets me at the door wagging her tail when I come home, plays fetch and will bring me the toy when she’s ready to play and makes chirping sounds and growls at animals that are being walked outside. She has the black bands and black tail tip. She has a tan coat with stripes and spots. The spots are not as well defined as an F3, more like an F5 maybe. She is fascinated with water but not really into splashing around in it yet. I have a 17 pound Tuxedo male that she will take down sometimes when they are “playing”. I’ve always wanted to own one. If she isn’t a true Savannah cat, she is close enough for me! I have an F4 who is a female and she is going to be 4 in July 2018. I just ordered an F1 Male Savannah from Texas, his name is Percy and the female is Ruby. Ruby loves to take walks with us no need for a leash she stays right by my side walking down the side walk. I have yet to receive the Kitten F1 Male named Percy he will be here tonight cant wait to raise him in my home. Can you post pics? I would love to see him. I am purchasing two F4 female Savannahs. They are sisters and will be my first experience with this breed. I am currently not in a state to start breeding Savannahs but would like too, after I retire. four weeks ago today a friend of mine rescued this adorable kitten from a very busy parking lot in the town i live in, it was 106 degrees outside that day and after a bit of a chase she was caught and my friend brought her to his home and after i looked her over to make sure that her only problem was dehydration and overheating i determined that she was okay. gave her some water and canned tuna (as she was so small wasn’t sure she could eat his cats’ food) left her to cool down on her own until i was ready to take her home, i have 5 older cats and knew everyone would have to adjust to her. i kept looking at her face and markings and realized she reminded me of a Savannah cat, after reading this article i am thrilled to say that Lil Duchess fits the description to a T! she is adventurous, courageous and very smart. she is a welcome addition to my fur family, i don’t intend to breed her, she is very much loved here! wish i could post her picture here. I am in Australia and got what I though was a 6 mth old tabby. Great markings, short tail, plays around me when I bath or shower and loves a good play and being higher up that me. U said they are illegal here….. But this one is not like normal cats….. I’ve had three previomy domestic short hairs over the last 40 year, this one is different. Any thoughts?